The proposals for Trump’s border wall are loud, ambitious, and dumb. Donald Trump will build his wall—on a short stretch of federal land in San Diego. The Department of Homeland Security will select a shortlist of companies to construct prototypes a stone’s throw from Tijuana. A continuous wall from the Gulf of Mexico to the Pacific Ocean, Homeland Security Secretary John Kelly said on Wednesday, is “unlikely” to be constructed. Instead, he said, the wall would be built on sections of the border. There is still no funding for Trump’s most famous campaign promise, but more than 200 firms have submitted a bid on the project, whose request for proposals closed on Tuesday. Up to 20 of the proposals will be selected by the government to be transformed into 30-foot-long prototypes in San Diego. The concepts, some of which were collected and published by the San Diego Union-Tribune and Wall Street Journal, display the wide degree of competence and pragmatism you might expect to find in a second-grade classroom. They are not an encouraging sight, architecturally or philosophically. But perhaps they can tell us something about the country, wall or no wall, that Donald Trump’s young presidency is already reshaping. While it’s difficult to account for the selection bias that led these firms to share their visions with the media—many bigger firms did not want to share renderings, the Union-Tribune reported—the level of attention-grabbing detail does stand out. 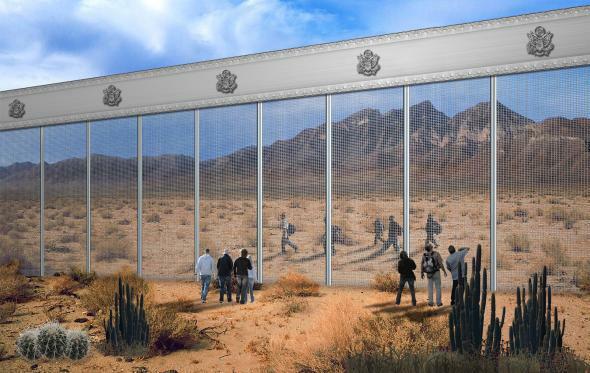 Penna Group includes the option of using a one-way sheet of plexiglass that would allow Americans to see the Mexican side of the border but not the other way around. This peacocking could suggest a kind of contracting game theory at work: The competition is so large, and the prompt simple enough to be outlined in one page, that standing out with a risky proposal is your best bet. But it may also reveal a fundamental impulse on the part of the bidders: If you’re going to spend four years and $22 billion building 1,250 miles of infrastructure, it had better be able to do something besides just sit there. Those ideas, for what else the wall might do or be, manage to be at once fanciful and vapid. Trump has long said his wall would be “beautiful,” and DHS has doubled down on this assurance by emphasizing that bids would be judged on aesthetics. (At least on the American side.) Some companies rose to the challenge. 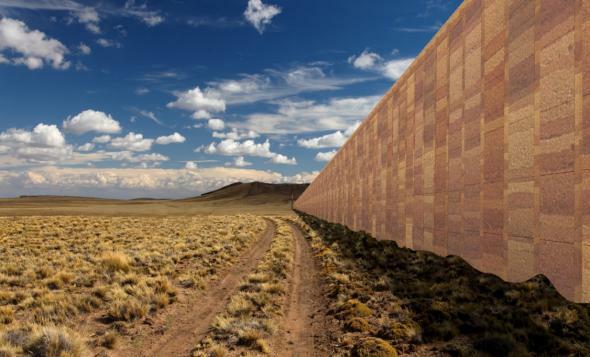 WTC Construction proposes a “rammed earth” design to “reflect the beauty of the border lands.” A firm in Illinois proposed a crenellated wall punctuated with parapets, complete with a recreational trail running on top—a design that would be “beautiful in a way that ordinary American citizens appreciate, rather than by being starkly institutional or by catering to the controversial and perverse tastes of the elites.” A third firm proposes precast segments featuring decorative recycled glass on both sides. Generous, but is it cost-effective? Some submissions are in protest. Jennifer Meridian, an artist from Pittsburgh, proposes several ideas that seem only slightly less practical than her more severe-minded peers. A “wall” of trees strung together with hammocks, a row of lighthouses, a line of 10 million pipe organs each spaced 20 feet apart. 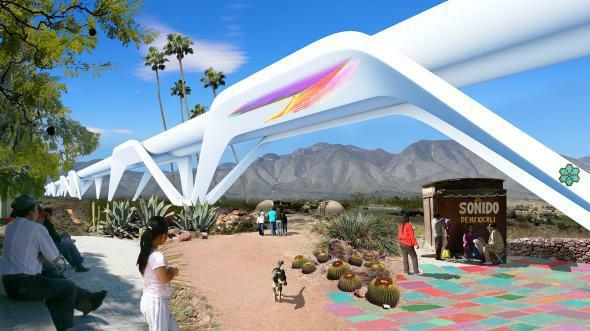 The Otra Nation collective, a group of Mexican and American engineers and planners, is proposing to build a $1 trillion hyperloop instead. Otra Nation, ground view near hyperloop. Even many wall-builders seem to want the thing to do something. It’s as if they know the president, with his magpie’s eye, might be captivated by a shiny idea and run with it. One such idea: a hundred-foot-deep trench for storing nuclear waste between a concrete wall and the Mexican border, proposed by Clayton Industries of Pittsburgh. This proposal also features railroad tracks, waste-to-energy plants, and a “micro grid circuit” embedded in the 30-foot wall. Several firms propose solar panels. One suggests an aqueduct. Without a doubt, the worst idea belongs to National Consulting Service, which proposes a giant concrete mall with a monorail running on top. But, you might say, nobody rides the toy train in downtown Miami or Detroit, why would they ride it along 1,250 miles of sparsely populated desert land? Well, what if I told you that the monorail would “use voice analysis technology to detect different emotional states of riders to possibly assist law enforcement.” Truly, the future is now. In Slate, Darshan Karwat argued that engineers should refuse to work on the wall. Judging by the submissions that various media outlets have made public, they took his advice. What’s left are firms who aren’t in on the joke, and the joke in this case is that this vast boondoggle will never be built, in concrete or in steel mesh, and will never carry an aqueduct or a monorail or a hyperloop or store nuclear waste. Just as the harassment of immigrants has deterred foreign applications to American universities, just as the stories of rogue border patrol agents taking travelers prisoner have deterred tourism to the United States, so these proposals demonstrate the essential and self-fulfilling truth of the wall: that even the idea of a wall-mounted monorail between Brownsville, Texas, and San Diego that records rider conversations for the police should deter immigrants by virtue of its very dumbness. A lighthouse for ideas, warning of a country where the good ones are dashed against the rocks. There’s a line in the RFP that gets right to the heart of it: “The north side of the wall (i.e. U.S. facing side) shall be aesthetically pleasing in color.” Pretty from the inside, and ugly to the rest of the world.